Last Thursday, the Nashville Mercy residents visited Field of Dreams Farm in Watertown, Tennessee for a day of volunteering and service. Field of Dreams Farm has a great relationship with Mercy and has been giving the Nashville home food discounts and donations for many years. Field of Dreams Farm began as a five acre farm dedicated to raising meats for a single family, but it quickly grew to a 117 acre farm committed to producing clean food for others. 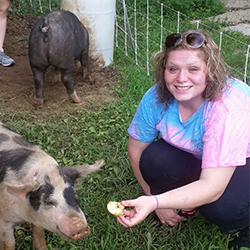 The farm is proud to raise their chickens, turkeys and pigs in humane, outdoor settings. During their service day, Mercy residents had the opportunity to have a tour of the farm; make signs for the garden; collect, clean and package eggs; and work and plant the fall garden. “This is a way for the residents and staff to give back!” said Rachel Herman, Mercy staff. “I had such a good time at the farm! God just showed me that we should always have our hearts positioned to give no matter what that looks like: your time, your money, or whatever,” said Ashley, another Mercy resident. 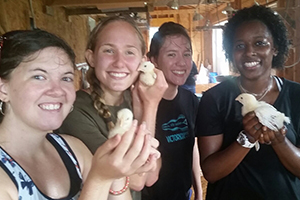 Mercy is thankful for the opportunity to serve and partner with Field of Dreams Farm. Click here to learn how you or your organization can partner with Mercy and support young women as they break free from their life-controlling issues.